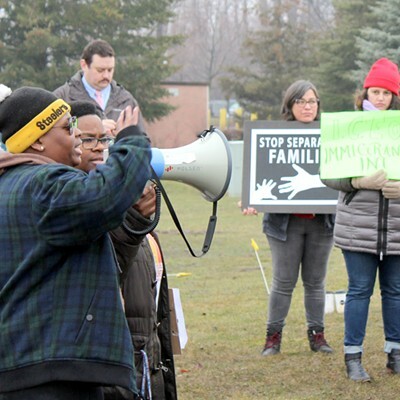 Immigrant rights advocates gathered today outside of the Buffalo Federal Detention Facility at Batavia in support of undocumented women facing deportation. 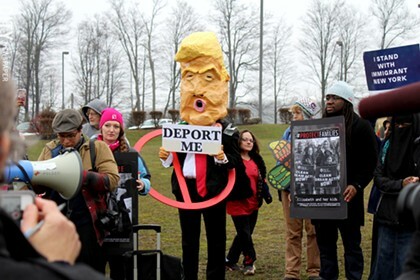 More than 50 people, including many from New York City — and one sporting an oversize Donald Trump head, orange skin and all, holding a "Deport Me" sign — stood close together to listen to women speakers tell their own stories and call for solidarity with local immigrants. 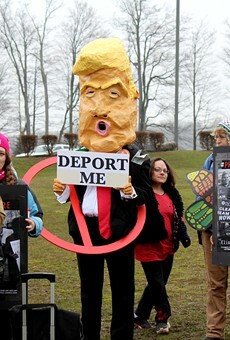 The rally was coordinated with an Upstate woman's appearance in front of Immigration and Customs Enforcement at Batavia scheduled for today. 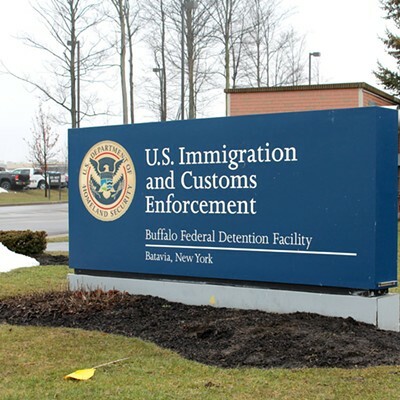 Arely, a Syracuse woman originally from Guatemala, and her husband were driving to Ithaca in 2013 when they were pulled over, and not having New York drivers' licenses, they were detained and turned over to Border Patrol. Since then she had been having regular phone check-ins with ICE, but immigration authorities called for her to appear in person today in Batavia. Rally organizers wanted to highlight women being detained in Batavia, which they said is a new development. 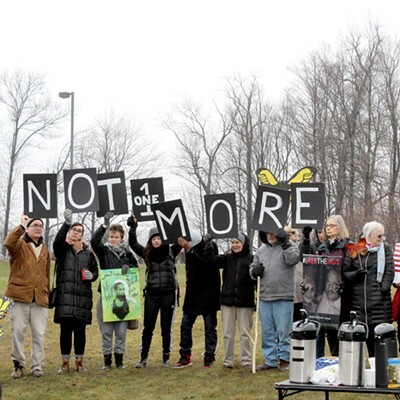 "They're detaining women here in Batavia, and they didn't used to," said Fabiola Ortiz Valdez of the New York Immigration Coalition. "That means the deportation machine is growing." 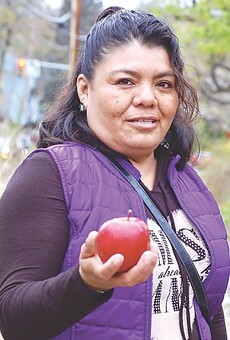 Among the speakers was Dolores Bustamante, an Upstate apple farm worker who was pulled over in 2014 and now faces deportation. "Unfortunately, there are so many of us women who are going through this process," she said, through a translator. "We are being separated from our families." 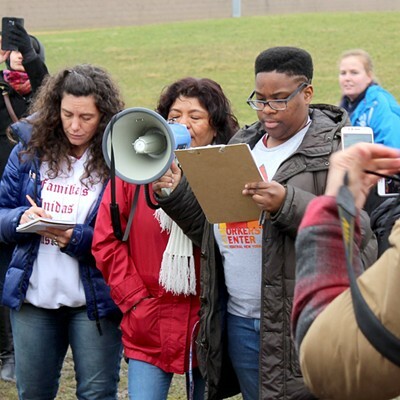 In the crowd were organizers from the Worker Justice Center, Workers' Center of Central New York, the Hispanic Latina Women's League, ICE Free NYC, Washington State's Familias Unidas Por La Justicia, the Geneseo Student Coalition for Migrant Workers, and Black Lives Matter Syracuse. "Black people are being criminalized and targeted. Also, we have black people who are immigrants," said Rahzie Seals, a BLM Syracuse organizer whose cousin was killed by police. "Our struggle for basic human rights is connected." Seals also shared her story about being recently assaulted and beaten by a group of men while she and her friend were shopping. While she was in the hospital, friends stayed with her and tended to her inured friend as well. "That was solidarity," she said. A statement was read from a woman who was detained and separated from her husband after they were pulled off of a Greyhound bus. And another woman spoke about her husband being picked up by ICE from their home and detaining him in Batavia for 11 months. The man has epilepsy, and had multiple seizures a day. "He could have died in there," she said. 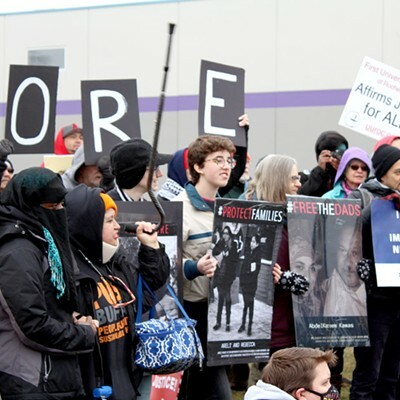 "Isn't it disgusting," said Nikeeta Slade, an organizer with the Workers' Center, "that this is a country that is obsessed with family values, but then it has the cruelty and the audacity to rip families apart?"